‘Composing is like driving down a foggy road toward a house’, Benjamin Britten once said: ‘Slowly you see more details of the house – the colour of the slates and bricks, the shape of the windows.’ The comparison is interesting, not least because certain defining qualities of Britten’s music – brilliance and wit, clarity and luminosity – might easily be taken to be the results of a more direct and intuitive creational process. It is also slightly surprising, coming from a composer who had been strikingly precocious in his youth – the apparent ease with which Britten as a young boy wrote a large amount of music brings Mendelssohn or Mozart to mind. This collection of works for string orchestra combines two of Britten’s first master-pieces, Simple Symphony and the Frank Bridge Variations, with the even earlier Elegy for Strings – recorded here for the first time – and Two Portraits, composed between the ages of 14-16. The second of the Portraits is actually a self-portrait, with a solo part for the viola – Britten’s own instrument – here performed by Catherine Bullock, who is also the soloist in the composer’s Lachrymae. Subtitled ‘reflections on a song of John Dowland’, this piece is a later one, originally composed for viola and piano in 1950, but Britten returned to it shortly before his death in 1976, recasting it for solo viola and small string orchestra. 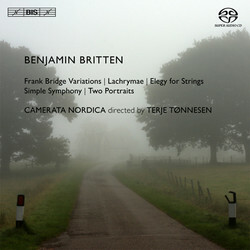 Directed by the Norwegian violinist Terje Tønnesen, the Swedish string ensemble Camerata Nordica performs this programme with an engaging directness and striking virtuosity – qualities which no doubt contributed to the team being entrusted by the Britten-Pears Foundation with making the world première recording of the Elegy, as well as giving its first public performance during the 2013 BBC Proms.